Mark Sinacori was born in Lawrence, Ma on August 16, 1982. He attended the John R. Rollins School and Holy Trinity School (class of 1996) for Elementary and Middle School, Central Catholic High School (class of 2000), and is a graduate of Merrimack College (class of 2005) with a BA in English and a graduate of UCLA'S Professional Screenwriting Certificate Program (class of 2006) with a certificate in Screenwriting. 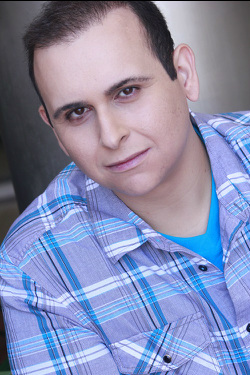 He is a writer, producer, actor, and voice actor in Los Angeles, Ca. Growing up in Lawrence, Mark's dream when he was a toddler was to be a garbage man when he grew up, emptying garbage barrels and throwing them all over the place at curbs. As an only child, Mark was brought up Catholic, was very inclusional and accepting of others, and loved entertainment and the arts, especially TV and Film. Throughout high school at Central Catholic and also at Merrimack College, both schools which had nothing to offer students a background in television or film, Mark took many creative writing and art classes to enhance his background in both writing and acting and worked at McDonald's as a shift manager where he hosted many kids birthday parties. Growing up, Mark was always a heavy kid and teenager, always 20 pounds or so heavier than those his age. By the time he reached high school, his weight was uncontrollable, and in college, at 6 feet tall, he reached 300 pounds at the age of 20 in 2003. A new diet and exercise plan, along with hypnosis, helped him to lose 50 pounds by the end of that summer, and an additional 100 pounds by the end of summer 2004 came off with sweating in saunas and slimming detox body wraps. It has always been a goal of Mark's to help people lose weight who have always struggled with weight gain. On September 2nd, 2005, Mark moved to Los Angeles after he was accepted into UCLA's Professional Screenwriting Program. It was there he heard it from both of his teachers that he had a lot of energy and character when reading screenplays in class, and that he should no doubt go into acting if that's a career choice he was thinking of doing. Both of his professors told him to be an actor and to write while acting. Following the Screenwriting Program at UCLA, Mark then worked as a studio Page at CBS throughout 2007 after visiting the studio several times the previous year to see tapings of The Price Is Right. CBS was Mark's most memorable time in Los Angeles, where he greeted, processed and entertained audiences at The Price Is Right. Mark got to work amazing events at The Price Is Right, including being selected to rehearse as a practice contestant with potential hosts such as Mario Lopez, George Hamilton and Todd Newton on several occasions, and also was selected to work Bob's final Million Dollar Spectacular, his 50 year's in television celebration episode, and his final show. Aside from The Price Is Right, Mark also worked on other shows that taped at CBS such as Dancing With The Stars and American Idol. Also at CBS, Mark was told he had a lot of character and energy by both his managers and the staff at The Price Is Right and was told to go into acting as well by them. While working an episode of The Late Late Show with Craig Ferguson in March of 2007, Mark was asked by the director to be in a backstage comedy sketch with actress Piper Perabo and one of Craig Ferguson's production assistants on the show. In the sketch, Piper tells the assistant that his writing was not funny and Mark pats him on the shoulder telling him "It's okay buddy, you're still funny to me." The sketch, though filmed, never aired, but was the first time Mark had been asked to film anything with a line that was on a Hollywood production of any sort. When his time as a Page ended, Mark continued writing and began his production and acting experience when he was part of the production crew on several independent features, and acted in several independent short films. In 2009, Mark was asked to be on the series Glee as a featured character in a scene where he interacted with Matthew Morrison, and after that point, after being featured, anytime he'd work as an extra, if there were close up reaction shots, most of the times he was picked out to be featured in certain scenes in different shows he worked. Since 2009, Mark's been featured on different TV series such as Glee, Desperate Housewives, Men of A Certain Age, Greys Anatomy, The Defenders, and Don't Trust The B-In Apartment 23. Mark's first short film Womanizer was directed by Drew Barrymore's older brother John Barrymore and was completed in 2014. Mark's future film projects will all be directed by himself from now on, as he's now ready to take on being a producer, writer, and director of his own works after an 8 year long learning period of working on both Hollywood and indie sets as an assistant and actor. Since early 2010, Mark has taken many acting classes. He has been professionally trained in Hollywood as a Screenwriter by Television Screenwriters Paul Chitlik and Fred Rubin, and as an Actor by Actors John Blyth Barrymore Amy Lyndon, and Judy Kain. Recently, Mark's been keeping very busy the past few years. Whether it's working a job not in entertainment or working a job in it, he's always ready to work, always happy to work, and has worked on a good amount of Hollywood productions throughout the latter part of 2014. Presently, he's been paging on shows such as Fuller House, Mike & Molly, Two And A Half Men, 2 Broke Girls, Mom, Your Family Or Mine, I Didn't Do It, Girl Meets World, and America's Funniest Home Videos. In his past 10 years living in Los Angeles (2005-2015), Mark has learned a lot about filmmaking, television production, acting, and has worked on many sets in many different studios in the Los Angeles area including CBS, ABC Prospect, Warner Bros. CBS Radford, Paramount, FOX, Sony, Universal, Los Angeles Center Studios and Manhattan Beach Studios, and has learned a lot by being an extra, featured extra, and audience page while working many shows all over town.